The infamous Tokyo Shinto shrine dedicated to Japan's war heroes, up to and including WWII, and some of its convicted war criminals (that's the controversial bit!!). China and Korea in particular have severe issues with this place, as the Japanese military's despicable behaviour in those countries, especially the Nanjing massacre, is given a very twisted portrayal in the museum, and is hardly covered at all. Ever since Japanese prime ministers resumed the practice of visiting the shrine to pay their respects to those "war heroes" with much publicity, this has been echoed esp. in South Korea by angry demonstrations. In Japan, however, there is a strong nationalist faction for whom this place is nothing short of the holy of holies of Japan's past glories and the one place to visit to pay one's respects to those who gave their lives for the country (well, they're nationalists … - it has to be pointed out, though, that there's also strong opposition within Japan against the shrine's role). For the dark tourist it's precisely this controversial nature of the place that makes it interesting, that and those parts of the adjacent museum that deal with the various Kamikaze operations. What there is to see: The shrine area is in part a place of worship, in part a kind of "amusement park". As you enter the site from the main gate, passing under an oversized steel torii gate, the path is lined with fast-food stalls and beer gardens, and you see people happily having a beer or enjoying a snack. As you get closer to the central shrine itself, the atmosphere becomes more sombre. You usually see groups of people doing the typical traditional spiel of bowing, clapping and tossing coins at the shrine. Turning right at the shrine and past another couple of buildings you get to the unmissable glass facade of the museum, behind which you can already see one of its large exhibits, a "Zero" fighter plane in war-time colours. Also in the foyer hall is a locomotive from the Death Railway in Thailand! Past the ticket machines, there's a pre-given, signposted circuit through the main exhibition (starting upstairs) – though you can deviate from it and skip bits in the side wings. The first few rooms hold little of interest to the dark tourist: lots of older military regalia, photos of war heroes of old, charts of battles, artefacts like guns, helmets, and so on. It's only when you get to the central WWII parts that things get somewhat more interesting – and more controversial. Look out for the slanted descriptions of e.g. the developments leading up to Japan's involvement in WWII – they make it look like they were the ones who had wanted to preserve peace and were just forced into war in order to gain access to raw materials … namely in China, Indonesia, Korea, Indochina etc. That is: allegedly it was basically the USA's fault, because they denied Japan access to those resources, so that Japan "had to" go on such a conquering spree … or something like that. Anyway, how exactly Pearl Harbor links up with this kind of argument is not made clear. But the historic military success of the operation is, as you would expect, lavishly illustrated. You won't find Japanese war crimes such as the Nanjing massacre given much of a mention here, of course. The Japanese nationalist interpretation is, unsurprisingly, that it a) had a much lower death toll than is normally accepted, b) that the Japanese army is not to blame for anything, c) that they came as liberators … i.e. the usual denial strategies. What the museum is quite frank about, though, is the issue of Kamikaze operations. Here, they are of course portrayed as particularly heroic. How the young pilots and submariners were made to sacrifice their lives is not a point elaborated on here. The most poignant exhibit is the "Ohka" ('cherry blossom') manned flying bomb. This was different from other planes used for Kamikaze attacks. Normally they were regular fighter planes that the pilots instead steered into some target. But the Ohka was specifically designed for the purpose, and nothing else! It was basically a manned missile, dropped like a regular bomb/missile from heavy bombers, then the "pilot" would ignite the Ohka's rocket boosters and steer the device into a target. It couldn't even go down in any other way lacking any sort of landing gear. This particularly stark element of inescapable deadliness makes it the darkest exhibit here. There are also a couple of Kamikaze submarines on display which were similarly special designs, thus the marine equivalent of the "Ohka". The inclusion of these bits of dedicated Kamikaze equipment, not just the regular "Zero" fighters, also makes the Yushukan different from the other Kamikaze museums in Japan, especially Chiran. The heroism element pervading the Yushukan can be a bit off-putting. At Chiran, the main Kamikaze-related memorial space, it's all somewhat less nationalist/revisionist in its approach and a bit more dignified (though still rather glorifying). Signage and descriptive texts in the Yushukan museum are usually in Japanese and English; though some exhibits are Japanese only. The same applied to a special exhibition tagged on to the main museum at the time of my visit in April 2009. At the entrance, foreigners are handed a free brochure in English which describes the general layout of the museum but doesn't help much beyond that. In the foyer is also a museum shop. This offers all manner of tack and militaria souvenirs, but informational material is available only in Japanese. Location: north-west of central Tokyo, just north of the Budokan and the Imperial Palace area, in the district of Chiyoda. Access & costs: fairly easy to reach; shrine area free, museum a little overpriced. Details: It's just about walkable from central Tokyo, and mostly along a pleasant route for a city, namely first via Imperial Gardens east park and then onwards north, through Kitanomaru Park and past the Budokan. Then turn left and cross the road, to get to the eastern entrance to the Yasukuni park/shrine complex. Coming by public transport is also an option: take either the Chuo-Sobu train line or the metro, Namboku line, to Ichigaya, then walk east along Yasukuni Dori, or get out at Iidabashi station, and then walk south on Waseda street. Alternatively get the Tonzai line to Iidabashi or to Kudanshite station and walk west along Yasukuni Dori from there, the latter is in fact closest to the main shrine area entrance and is also reached by the Hanzomon line and the Toei Shinjuku line. Admission to the War museum: 800 Yen for the main exhibition, which is not cheap, especially if you are, as a dark tourist, interested in only parts of the exhibition. There are some discounts for students and groups. Access to the downstairs gallery is free (but contains little: just that one "Zero" fighter plane, the Death Railway locomotive, plus a couple of guns … and the shop). Museum opening times: daily from 9 a.m. to 4:30 p.m. (closed for "a few days" in late June and late December, according to the website … exact dates are not given). The museum is wheelchair accessible. Officially, no photography is allowed inside the exhibitions, but I saw lots of (esp. Japanese) visitors ignoring this – the rule doesn't seem to be enforced or policed in any way. Time required: Military history buffs could probably spend a couple of hours here; the dark tourist less interested in the heroic side, uniforms, etc. and more focused on the dark bits could rush through in as little as ca. 30 minutes. Combinations with other dark sites: see Tokyo. 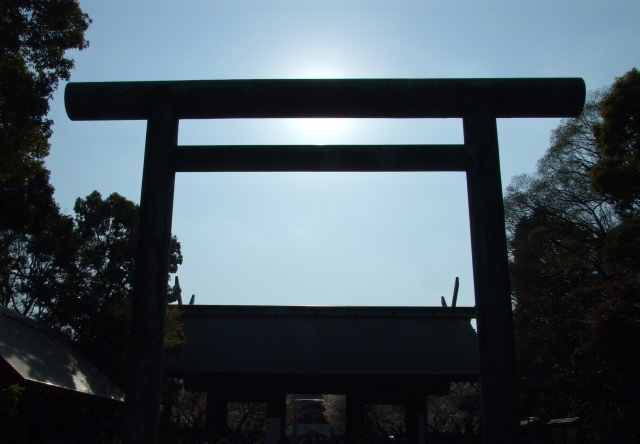 Combinations with non-dark sites: generally see Tokyo – the Yasukuni shrine area is just to the north-west of Kitanomaru Park and the Imperial Gardens east park, which are, unlike the palace grounds as such, publicly accessible, except Mondays. 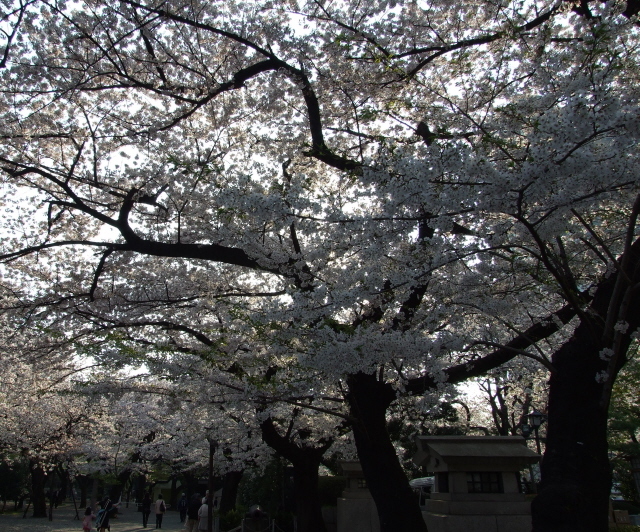 At cherry-blossom time, usually between late March to late April, the shrine and the park areas to the south make good spots for viewing cherry-blossom trees – and for watching the Japanese gazing at, and photographing en masse, those cherry blossoms.